Chicken yakitori is a well known Japanese dish which lends itself to enjoying with an ice cold beer in hand. It is usually cooked on skewers and grilled but I have chosen to break with tradition and cook the chunks of chicken separately on a griddle for extra caramelisation. Most recipes ask you to strain your sauce of ginger and garlic goodness however I found that you don’t need to do this as, if you are careful, the sauce won’t burn and you’re still left with a hit of those fantastic flavours. 1. Kick off by adding the soy sauce, mirin and sake together before adding in the sugar, ginger and garlic. Heat over a low heat and bring it to a simmer. Cook until the sugar has dissolved and the ginger and garlic are softening. Add the cornflour mixture and cook further until the sauce is thickened and glossy. 2. Take the sauce from the heat and allow to cool. As I say, I don’t strain the sauce as I like the ginger and garlic but you can sieve it at this stage if you like. When the sauce is cool, coat the chicken chunks with the majority of the sauce but reserve a small amount for later. Place the chicken in a covered bowl and refrigerate for at least an hour. 3. When you are ready to get cooking, warm a griddle pan to medium and cook the chunks of chicken until cooked through. This should take around 8-10 minutes depending on how large your chunks are. Halfway through cooking brush the remaining sauce over the chicken. The result should be tender and caramelised chicken. Serve with rice if you like and eat immediately. A flourish of toasted sesame seeds or crunchy shredded spring onion is also delicious. Caramelised yakitori bites- crack open a beer and enjoy! 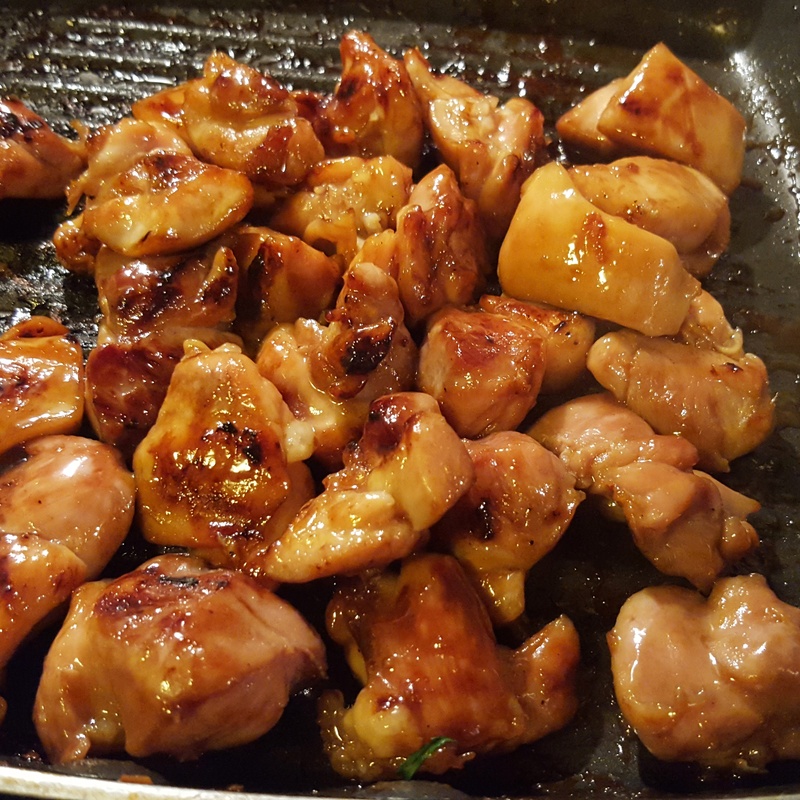 This entry was posted in Recipes and tagged asian, chicken, garlic, ginger, mirin, sake, soy, yakitori by sotiris14. Bookmark the permalink.